When we learn, each of us will prefer to process new information through one of our senses. VISUAL learners need to see the dance performed or look at the directions before trying the steps. AUDITORY learners need to hear the directions and will usually say the directions to themselves as they do the steps. KINESTHETIC learners need to actually go through the steps and “feel” what the dance is like. Most teachers are not connecting with a large percentage of their audience in their presentations. Research shows that 40% are visual learners, 40% are auditory and the remaining 20% are primarily kinesthetic. Learning is dependent on the strategy used in the way the material is presented. A teacher usually teaches the way he/she was taught or in the style that he/she learns. Now if the style of the learner and teacher matches - SUCCESS! Mostly they are mismatched and the student feels comes out the loser, not the teacher. Teachers need to learn to teach in a variety of styles to reach every student - sounds hard but isn’t really. Have you ever noticed how talk show hosts, radio announcers and motivational speakers inject sound effects and music into their programs? David Letterman uses effects from Paul Shaeffer’s band and the sound of glass breaking when he throws a card away. Since I began noticing sound effects in presentations, a lot more stand out, from the voices of celebrities saying things which are taken out of context on purpose (MAKE MY DAY! ), to song clips which can underline your message with humor. If you even uttered a chuckle or tiny snicker, then the effect registered in your brain and at the same time the presenter’s message. 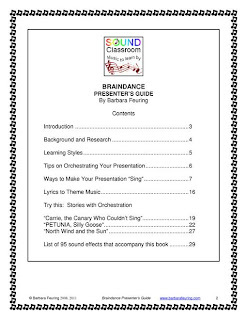 Years ago I produced a "Braindance Sound Effects" CD in the studio and a guide to accompany the CD. I sold a lot of copies. I have now turned this into 95 high quality MP3 files to accompany the book. My book will give you the chance to address your students or audience with a greater impact on their listening and learning. I will provide you with useful examples for your next presentation. Try out a few sounds and soon you will be on your way. 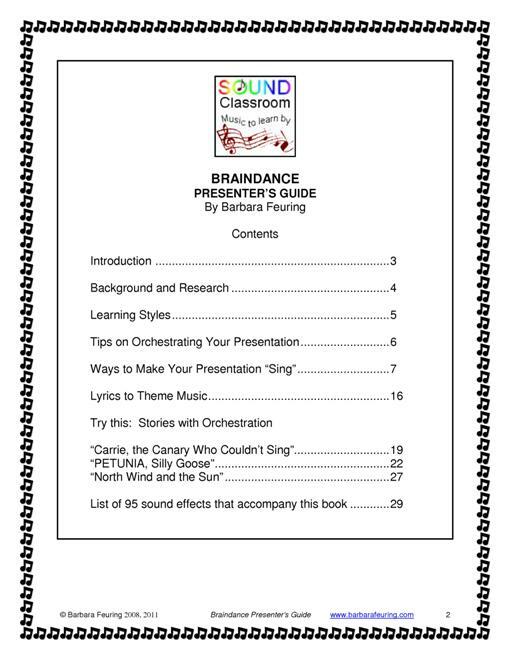 The 29-page guide Braindance Presenter's Guide (in PDF format) and accompanying 95 Braindance Sound Effects (in MP3 format) can be purchased and downloaded online as one package from TeachersPayTeachers. A free preview download is also available. After a long and successful career in teaching music in Western Canada; doing music consulting; and running an educational supply store; an opportunity presented itself to try international teaching in Cairo, Egypt. I spent an interesting 4 years teaching music in Cairo before following another opportunity to Riyadh, KSA (Saudi Arabia), where I taught music at the American International School of Riyadh for 5 years. I officially retired from teaching in June, 2011 and returned home to Surrey, BC, Canada where I am pursuing several ventures, but still never far from music and education. Dropbox allows you to sync your files online and between your computer devices automatically. Also great for teacher collaboration. Follow this link and get 2GB free space plus 250 MB free. To sleep or not to sleep! © Barbara Feuring, © Sound Classroom. Powered by Blogger.